Few things impact your life more than a serious health problem. Chronic diseases, including heart disease, stroke and diabetes; cancer; and communicable diseases affect the health of millions of people and cost billions of dollars in medical expenses every year in Missouri. Lifestyle choices – such as not smoking, maintaining a healthy weight and being physically active – can help prevent some of the most common chronic diseases and some types of cancer. Regular health screenings can often discover chronic conditions and cancers early when treatment is more likely to be successful. Communicable diseases can often be prevented through a number of measures including vaccines and proper hand washing. By making smart choices, Missourians can avoid or overcome many health problems and live longer and more productive lives. About two in five Missourians will have cancer during their lifetime. 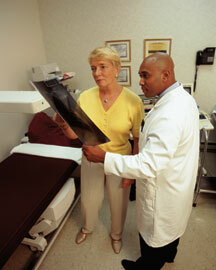 Screenings can detect several types of cancer including breast cancer, cervical cancer and colorectal cancer. Chronic diseases include asthma, heart disease, stroke, diabetes and arthritis. These diseases often can be prevented or controlled keeping risk factors, including high blood pressure, high cholesterol and elevated blood sugar levels, under control. Communicable diseases are caused by germs transmitted through people, animals, surfaces, foods and air. Influenza, or flu, is a highly contagious viral respiratory illness. Flu can cause a worsening of chronic medical conditions such as heart disease, asthma and diabetes. To help prevent the spread of the flu, a flu shot is recommended every year, especially for people who are at high risk for flu complications. Other vaccine-preventable diseases include measles, mumps, polio, dyptheria, tetanus, whooping cough, chicken pox, hepatitis A and hepatitis B.
HIV is the virus that causes AIDS. It attacks a person’s immune system, reducing the body’s ability to fight off infections. Efforts to prevent the spread of the virus, counseling and testing individuals who are at high risk, and caring for people living with the disease are key to reducing HIV and AIDS in Missouri. Zoonotic diseases are illnesses transmitted from animals to humans. West Nile Virus is spread through mosquito bites. Tick bites are responsible for a number of diseases including lyme disease, Rocky Mountain spotted fever, ehrlichiosis, tularemia and Q Fever. Rabies is spread through a bite from an infected mammal, most often a bat. Taking precautions to avoid bites from mosquitoes, ticks and mammals is the best way to prevent the spread of zoonotic diseases. Food borne illnesses can be prevented through safe food handling practices including proper hand washing, cooking foods to recommended temperatures and storing leftovers properly. To help promote food safety, the Missouri Department of Health and Senior Services and local public health agencies throughout the state regulate more than 30,000 food service and processing facilities and provide training on safe food handling, preparation and sanitation issues. Tuberculosis is spread through the air from person to person, usually through close day-to-day contact with a person who has TB such as a family member, friend or close co-worker. TB can be treated and cured if prompt medical attention is received.